Confession: I’m an enabler. Yes, you should eat that piece of cake. Champagne is always a good idea. Play hooky... you need a vacation! I will totally bake you cupcakes for your birthday. And those stilettos? Oh, you should definitely buy them. Definitely. I love others’ happiness and pleasures – small and large. And the thing about summer is that there are so many joys to share: warm evenings and cold cocktails, sweating in the stands at Fenway as the sun sets, tennis games. Brunch outside, juicy cherries for a snack, and lobster for lunch. And blueberries. I’m so happy it’s blueberry season. When the grocery store had a 2 for 1 deal on pints of blueberries, I felt like the grocery store was enabling my blueberry obsession. Thanks, grocery store. I mean it. Thanks for having my back. It may be the summer of the egg. But guess what? It’s the week of the blueberry. 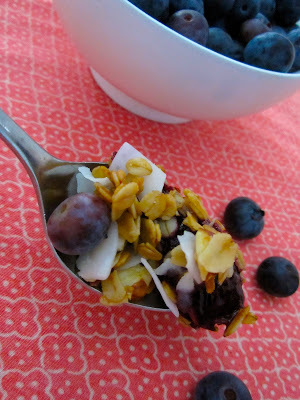 I’m starting with crunchy, sweet coconut-almond granola over warm blueberry compote. And then it’s going to get a little wild. Grey Goose, meet blueberries. Blueberries, meet Goose. You two will get along terrifically. Combine the oats, almonds, and walnuts in a bowl. Melt the honey, canola oil, and vanilla extract together in saucepan over medium heat and stir until well combined (1-2 minutes). Pour over the oatmeal mixture and stir well so that the oats are evenly coated. Spread the oatmeal mixture evenly on a baking sheet and place on the top rack of the oven. Stir the mixture at least every 10 minutes. I’m going to be blunt: it’s best if you watch it like a hawk. Burnt granola happens easily (and does not taste good). Bake the oats for a total of 30 minutes, or until the mixture is golden-brown and still slightly moist. Let the granola cool on the baking sheet for about 10 minutes, then use a spatula to scoop up the granola and store it in an airtight container. Stir in the coconut flakes. The granola will continue to crisp up. Makes approximately 3 ½ cups of granola. Wash the blueberries in a colander and drain well. Lay them out on several folded paper towels and pat gently to dry with another paper towel. Put the blueberries in a saucepan over medium-low heat. 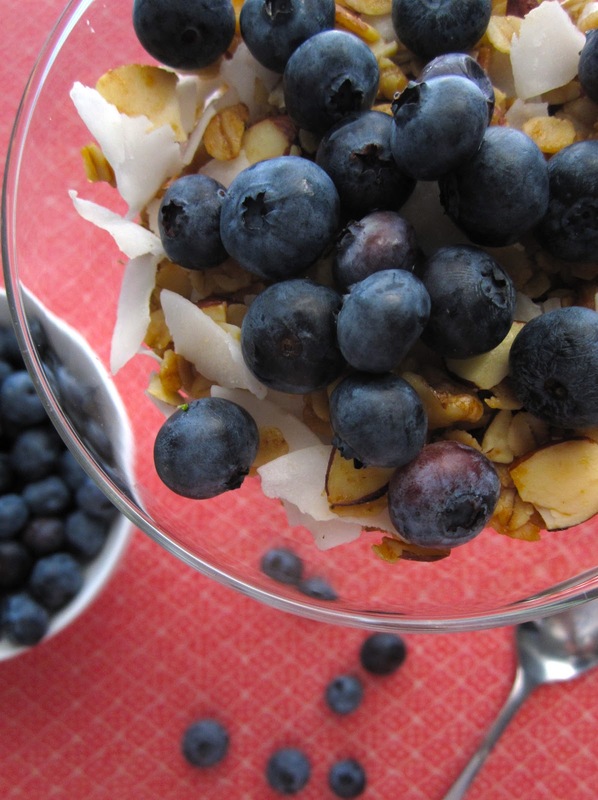 Stir gently and, when the blueberries began to soften, very gently mash them with the back of a spoon. Cook until the blueberries have a consistency like a very thick jam, about 5-7 minutes. Stir in the cinnamon and the brown sugar. 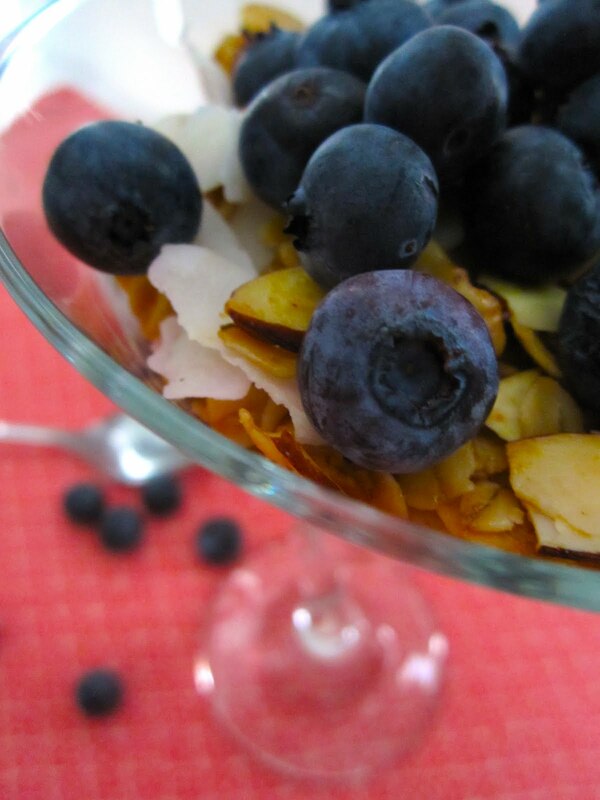 Layer the blueberry compote in a parfait glass (or a martini glass, in my case….) and top with a ½ cup of granola and another 2 tablespoons of blueberries. Serves one person. Definitely, definitely eat it warm. question - do you put the fresh blueberries directly into a sauce pan? any water needed? No water needed! As long as you keep the heat at medium-low and stir gently, they won't burn and they will start get soft pretty quickly. ok - awesome. Definitely trying this recipe out for next week!! Let me know how it turns out! I suggest going easy with the cinnamon and adding more gradually... And stir in more brown sugar, if you like.